Judea or Judæa (/dʒuːˈdiː.ə/; from Hebrew: יהודה‎‎, Standard Yəhuda Tiberian Yəhûḏāh, Greek: Ἰουδαία, Ioudaía; Latin: IVDÆA, Arabic: يهودا‎‎, Yahudia) is the ancient biblical, Roman, and modern name of the mountainous southern part of Palestine. The name originates from the Hebrew, Canaanite and later neo-Babylonian and Persian name "Yehudah" or "Yehud" for the biblical Israelite tribe of Judah (Yehudah) and associated Kingdom of Judah, which the 1906 Jewish Encyclopedia dates from 934 until 586 BCE. The name of the region continued to be incorporated through the Babylonian conquest, Persian, Hellenistic, and Roman periods as Yehud, Yehud Medinata, Hasmonean Judea, and consequently Herodian Judea and Roman Judea, respectively. "Judea" was the name used by English-speakers until the Jordanian occupation of the area in 1948. 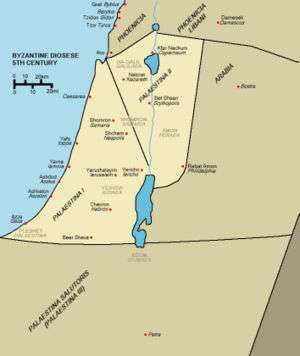 Jordan called the area ad-difa’a al-gharbiya (translated into English as the "West Bank"). "Yehuda" is the Hebrew term used for the area in modern Israel since the region was captured and occupied by Israel in 1967. Mediterranean oak and terebinth woodland in the Valley of Elah, southwestern Judea. 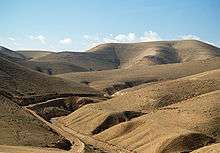 Judea is a mountainous region, part of which is considered a desert. It varies greatly in height, rising to an altitude of 1,020 m (3,346 ft) in the south at Mount Hebron, 30 km (19 mi) southwest of Jerusalem, and descending to as much as 400 m (1,312 ft) below sea level in the east of the region. It also varies in rainfall, starting with about 400–500 millimetres (16–20 in) in the western hills, rising to 600 millimetres (24 in) around western Jerusalem (in central Judea), falling back to 400 millimetres (16 in) in eastern Jerusalem and dropping to around 100 mm in the eastern parts, due to a rainshadow effect (this is the Judean desert). The climate, accordingly, moves between Mediterranean in the west and desert climate in the east, with a strip of steppe climate in the middle. Major urban areas in the region include Jerusalem, Bethlehem, Gush Etzion, Jericho and Hebron. 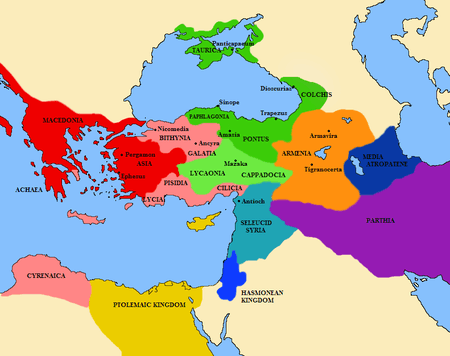 Map of the southern Levant, c.830s BCE. Judea lost its independence to the Romans in the 1st century BCE, by becoming first a tributary kingdom, then a province, of the Roman Empire. The Romans had allied themselves to the Maccabees and interfered again in 63 BCE, at the end of the Third Mithridatic War, when the proconsul Pompeius Magnus ("Pompey the Great") stayed behind to make the area secure for Rome, including his siege of Jerusalem in 63 BCE. Queen Alexandra Salome had recently died, and a civil war broke out between her sons, Hyrcanus II and Aristobulus II. Pompeius restored Hyrcanus but political rule passed to the Herodian family who ruled as client kings. In 6 CE, Judea came under direct Roman rule as the southern part of the province of Iudaea, although Jews living in the province still maintained some form of independence and could judge offenders by their own laws, including capital offences, until circa 28 CE. 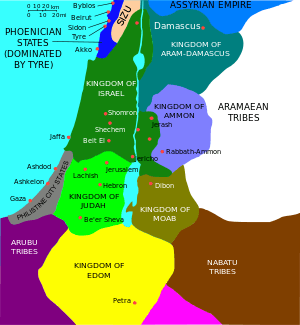 The Province of Judea, during the late Second Temple period was also divided into five conclaves, or administrative districts: 1) Jerusalem (ירושלם), 2) Gadara (גדרה), 3) Amathus (עמתו), 4) Jericho (יריחו), 5) Sepphoris (צפורין). Eventually, the Jewish population rose against Roman rule in 66 CE in a revolt that was unsuccessful. Jerusalem was besieged in 70 CE and much of the population was killed or enslaved. Again 70 years later, the Jewish population revolted under the leadership of Simon bar Kokhba and established the last Kingdom of Israel, which lasted three years, before the Romans managed to conquer the province for good, at a high cost in terms of manpower and expense. ↑ "Judah, Kingdom of". Jewish Encyclopedia. Retrieved 2014-04-10. ↑ A History of the Israeli-Palestinian Conflict – Mark A. Tessler – Google Books. Books.google.com. Retrieved 2012-12-31. ↑ Neil Caplan (19 September 2011). The Israel-Palestine Conflict: Contested Histories. John Wiley & Sons. p. 8. ISBN 978-1405175395. ↑ "This Side of the River Jordan; On Language," Philologos, September 22, 2010, Forward. ↑ "Judaea". Britannica. Retrieved 2012-12-31. ↑ "Ancient History Sourcebook: Josephus (37 – after 93 CE): Galilee, Samaria, and Judea in the First Century CE". Fordham.edu. Retrieved 2012-12-31. ↑ "Picturesque Palestine I: Jerusalem, Judah, Ephraim". Lifeintheholyland.com. Retrieved 2012-12-31. ↑ "Unlikely A Tale of Two Conquests: The Unlikely Numismatic Association Between the Fall of New France (AD 1760) and the Fall of Judaea (AD 70)". Ansmagazine.com. Retrieved 2012-12-31. ↑ Kuhrt, Amiele (1995). The Ancient Near East. Routledge. p. 438. ISBN 978-0415167628. ↑ "The Persians". Jewish Virtual Library. Retrieved 2009-06-09. ↑ "The Hasmonean Dynasty". Jewish Virtual Library. Retrieved 2009-06-09. ↑ "Roman Rule". Jewish Virtual Library. Retrieved 2009-06-09. ↑ "The Name "Palestine"". Jewish Virtual Library. Retrieved 2010-08-16. ↑ "Shimon Bar-Kokhba". Jewish Virtual Library. Retrieved 2009-06-09. ↑ Thomas A. Idniopulos (1998). "Weathered by Miracles: A History of Palestine From Bonaparte and Muhammad Ali to Ben-Gurion and the Mufti". The New York Times. Retrieved 2007-08-11. ↑ "Roman Arabia". Encyclopædia Britannica. Retrieved 2007-08-11.